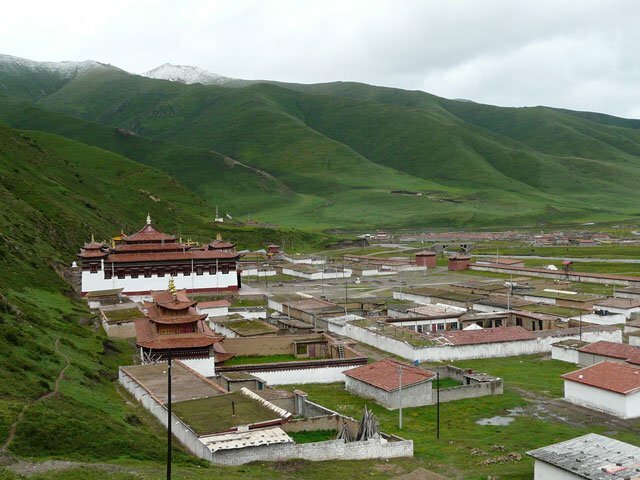 The Jonang Chamda Monastery was founded by Tsangwa Gelong Khenchen Ngawang Chöphel Gyatso, who is renowned as a great scholar. He was born in the Tibetan year of the earth monkey 1788, at a place called Zeyul Rapkha, and was taught by many scholars such as Tsangchen’s reincarnation Konchok Jigmey Namgyal Latse Ngawang Gyaltsen, Won Sangye Gyatso, Kongtrul Yonten Gyatso and Karma Wosal Gyurme, and was ordained by Panchen Rinpoche Tenpé Nyima. He received the profound teaching on the Kalachakra generation and completion stage and other teachings from the Jonang, Gelug, Kagyu, Nyingma and Sakya schools, and accomplished high realization. His disciples include Bhamda Thupten Gelek Gyatso, Zongchen Pal Trul, Shéchen Vero, Jamgon Kongtrul and many other scholars. 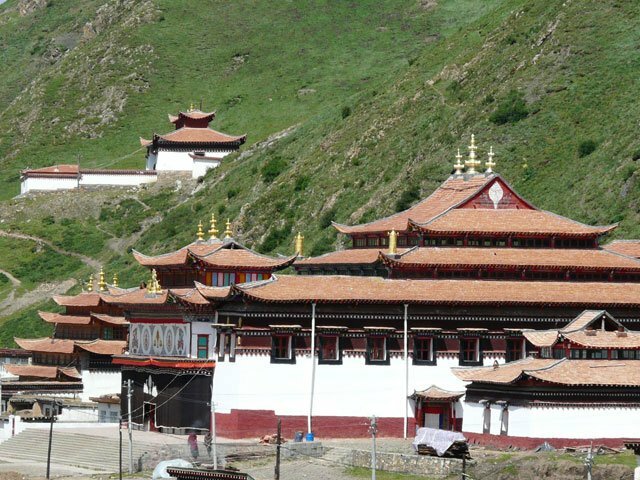 In the fourteenth rabjung of the earth rabbit year 1849, Chamda monastery was constructed, being named after the mountain behind which it is located. From then on it held Jonang’s tenets, and followed Lama Tsangwa’s tradition. During the cultural revolution, the monastery was almost destroyed and many statues were completely demolished. Many of the high teachers were unable to continue their work and passed away. Then, in 1985, work was undertaken to restore the monastery. From this time, the first teacher was Khésang Rinpoche, the embodiment of Avalokiteshvara and the twelfth resident lama. 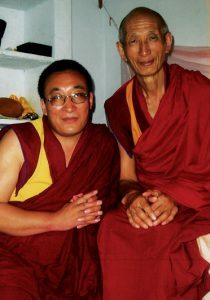 The thirteenth lama was Khen Rinpoche Kunga Sherap Saljé Phuntsok Jungney. 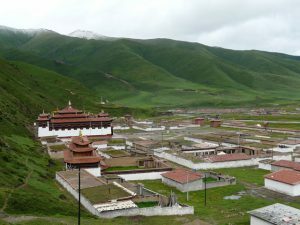 Within Chamda Monastery, there are three centers: the practice center Samten Ling, Thosam Ling shedra, and Lobchung Losel Ling. In the shedra monks study the teachings of the omniscient Dolpopa Sherab Gyaltsen, Jetsun Taranatha, Ngawang Lodrö Drakpa and Jamyang Bhamdha Lama Thupten Gelek Gyatso, as well as the five major sutra texts and the four classes of tantra. The practitioners in Samten Ling follow the Kalachakra Six Vajra Yogas practice and many others. The students at Losel Ling, meanwhile, study writing, reading, grammar, ritual practices, astrology, poetry, logic, medicine and history. 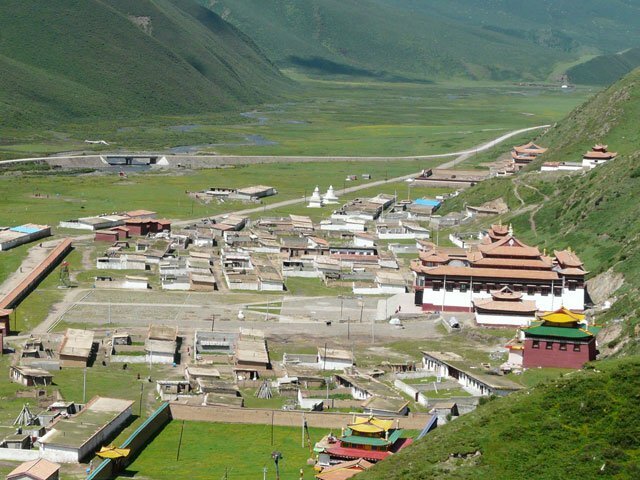 Since 1994 more than 40 monks have obtained permission to engage in Dharma work. Now there are 216 permanent monks, and around 300 altogether. 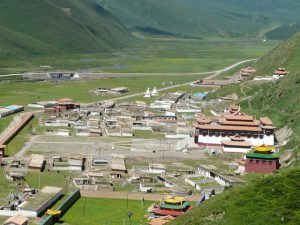 There is an assembly hall, tea hall, Kalachakra shrine, teaching hall, library, retreat centre, and around 100 monks’ rooms. Many rituals are carried out on important dates of the Tibetan calendar. One of Lama Lutrin’s contemporaries, Khenrinpoché Kunga Sherab Saljé was a student of Lodrö Drakpa and had received extensive teachings in all the eight great practice lineages. 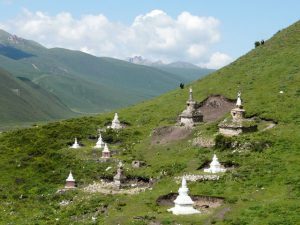 Like Lama Lutrin, when the religious restrictions were lifted in 1980, Khenpo Sherab made significant effort to revive the teachings, not only within the Jonang but also in other traditions. Khenpo Sherab was the first high lama from the Jonang Tradition to travel to India and Nepal where he gave teachings to the Fourteenth Dalai Lama and to the Karmapa’s tutor Bokar Rinpoché. Since 1992 his main student Khenpo Lobsang Chödrak, has been teaching the Jonang Dharma to the monks of Chamda. 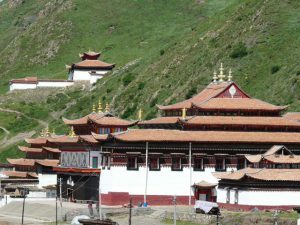 It was during his time in Chamda Monastery that Khentrul Rinpoché studied Zhentong Madhyamaka with Khenpo Sherab and wrote a short treatise clarifying many points on the subject.